The wait is finally over: brand new summer dishes! We have been rather quiet this June perfecting our new summer menu, with inspiration taken from some of the world’s more fortunate climates. 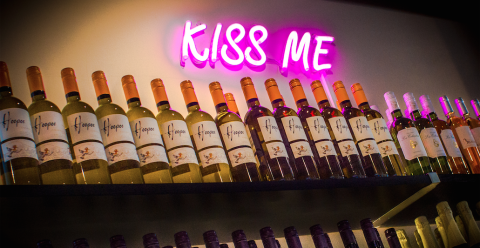 Allow your taste buds to take a journey around the globe: from the Mediterranean, to South East Asia and the ‘Deep South’ with a variety of vibrant, flavourful dishes. 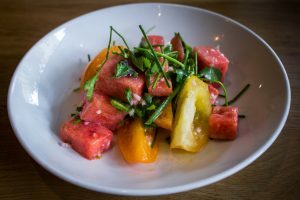 We’ve allowed chunky watermelon pieces to ripen enough for optimum sweetness, pairing them with sour tomatoes. Shiso leaf and yuzu dressing. A beautiful dish to behold! Is there anything more pretty than these Sicilian tomatoes? They sit atop creamy, savoury cheese. 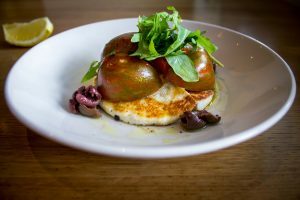 The acidity of the tomato and lemon delicately offsets the density of the cheese – kalamata olives make it moreish. Simplicity is often best, and this dish proves that! 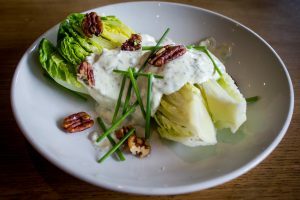 Crunchy baby gem lettuce is bathed in luxurious vegan salad cream; smoked pecans add a hickory depth, and aromatic chives cut through the decadent dressing. 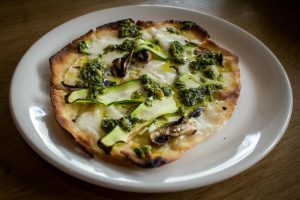 An exciting first for Mildreds, we have just introduced out very first Pizzetta – a classic, crusty base is topped with soft salty-sweet mozzarella, herby garlic and basil sauce and meaty mushrooms. A lighter way to enjoy pizza! 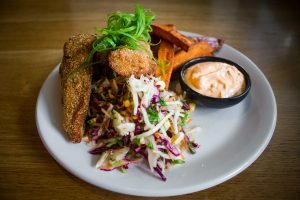 The fried chick’n is perfectly crispy on the outside, remaining succulent on the inside; it’s accompanied by earthy coleslaw and sweet potato fries. 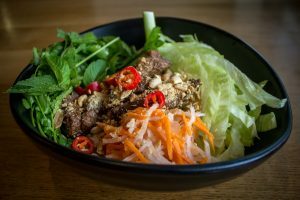 Say ‘xin chao!’ to our vegan take on a Vietnamese classic, ‘bun thit nuong’. A fresher way to enjoy the spirit of a summer: BBQ flavours with a crunchy salad, tangy pickles and sticky rice noodles. Rất ngon! 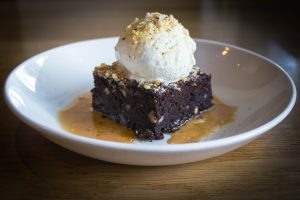 If you’ve been longing for the return of Mildreds’ brownie, you’ll be relieved to know: our infamous brownie is back, now in a pool of salted caramel! 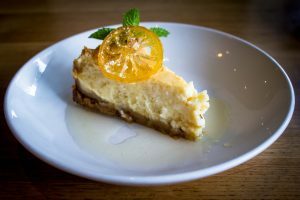 Sicilian lemons make a reappearance on our summer menu, this time caramelised to enliven a sumptuous baked cheesecake. If you thought Summer was the wrong season for crumbles, you probably haven’t spent many in the UK! 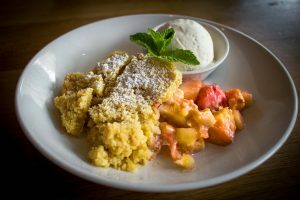 For those typical British summer days, with a slight bite in the air, you’ll appreciate the fruit crumble with ice cream. 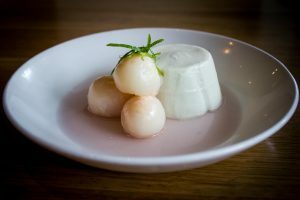 Subtle Asian pandan adds a fragrant depth to this silky panna cotta, served with lightly floral hibiscus-scented lychees. 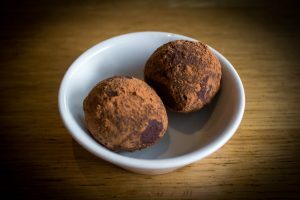 You won’t believe it’s vegan! 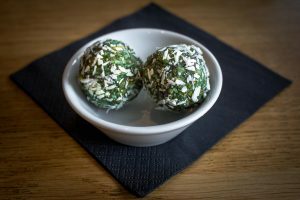 Don’t forget everyone’s favourite vegan-raw-gluten-free-sugar-free-guilt-free after dinner balls!